How is formidable visual performance in dim light possible, especially in insects, with tiny eyes and brains less than the size of a grain of rice? On a moonless night, light levels can be more than 100m times dimmer than in bright daylight. Yet while we are nearly blind and quite helpless in the dark, cats are out stalking prey, and moths are flying agilely between flowers on our balconies. While we sleep, millions of other animals rely on their visual systems to survive. The same is true of animals who inhabit the eternal darkness of the deep sea. In fact, the overwhelming majority of the world’s animals are primarily active in dim light. How is their formidable visual performance possible, especially in insects, with tiny eyes and brains less than the size of a grain of rice? What optical and neural strategies have they evolved to allow them to see so well in dim light? To answer these questions, we turned our attentions to nocturnal insects. Despite their diminutive visual systems, it turns out that nocturnal insects see amazingly well in dim light. In recent years we have discovered that nocturnal insects can avoid and fixate on obstacles during flight, distinguish colours, detect faint movements, learn visual landmarks and use them for homing. They can even orient themselves using the faint celestial polarisation pattern produced by the moon, and navigate using the constellations of stars in the sky. In many cases, this visual performance seems almost to defy what’s physically possible. 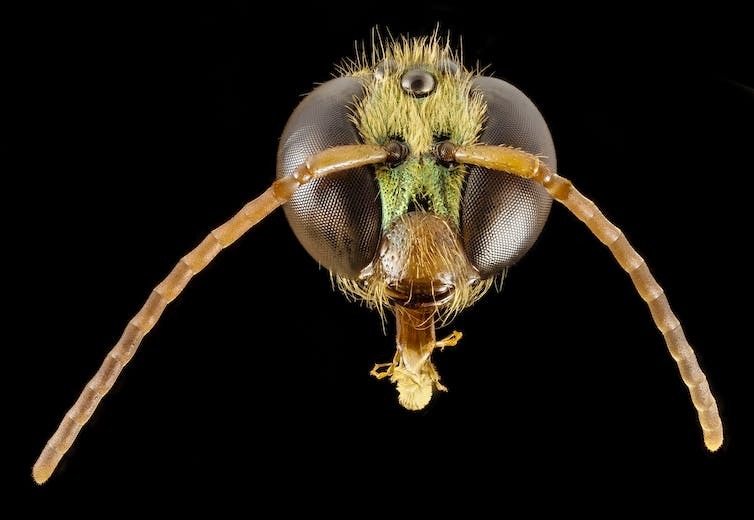 For example, the nocturnal Central American sweat bee, Megalopta genalis, absorbs just five photons (light particles) into its tiny eyes when light levels are at their lowest – a vanishingly small visual signal. And yet, in the dead of night, it can navigate the dense and tangled rainforest on a foraging trip and make it safely back to its nest – an inconspicuous hollowed-out stick suspended within the forest understorey. To find out how this kind of performance is possible, we recently began to study nocturnal hawkmoths. These beautiful insects –- the hummingbirds of the invertebrate world –- are sleek, fast-flying moths that are constantly on the lookout for nectar-laden flowers. Once a flower is found, the moth hovers in front of it, sucking the nectar out using its proboscis, a mouth-like tube. 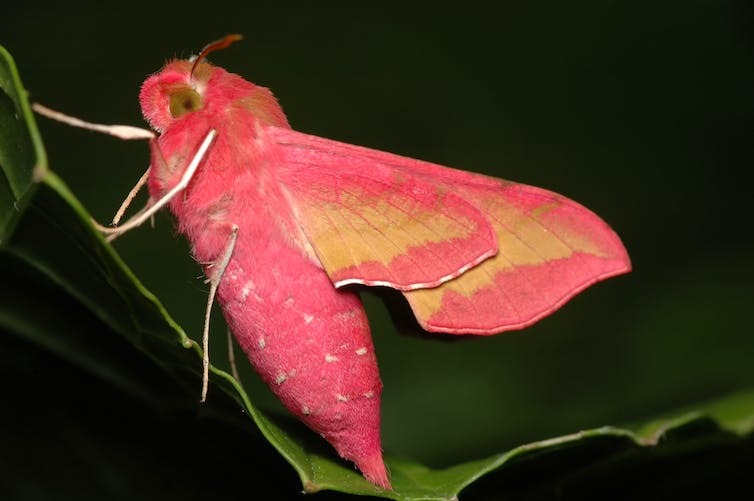 The nocturnal European Elephant hawkmoth, Deilephila elpenor, is a gorgeous creature cloaked in feathery pink and green scales and does all its nectar gathering in the dead of night. A number of years ago we discovered that this moth can distinguish colours at night, the first nocturnal animal known to do so. Why do cats have slit-shaped eyes? But this moth recently revealed another of its secrets: the neural tricks it uses to see well in extremely dim light. These tricks are certainly used by other nocturnal insects like Megalopta. By studying the physiology of neural circuits in the visual centres of the brain, we discovered that Deilephila can see reliably in dim light by effectively adding together the photons it has collected from different points in space and time. For time, this is a little like increasing the shutter time on a camera in dim light. By allowing the shutter to stay open longer, more light reaches the image sensor and a brighter image is produced. The downside is that anything moving rapidly – like a passing car – will not be resolved and so the insect won’t be able to see it. To add together photons in space, the individual pixels of the image sensor can be pooled together to create fewer but larger (and so more light-sensitive) “super pixels”. Again, the downside of this strategy is that even though the image becomes brighter, it also becomes blurrier and finer spatial details disappear. But for a nocturnal animal straining to see in the dark, the ability to see a brighter world that is coarser and slower is likely to be better than seeing nothing at all (which would be the only alternative). Our physiological work has revealed that this neural summation of photons in time and space is immensely beneficial to nocturnal Deilephila. At all nocturnal light intensities, from dusk to starlight levels, summation substantially boosts Deilephila’s ability to see well in dim light. In fact, thanks to these neural mechanisms, Deilephila can see at light intensities around 100 times dimmer than it could otherwise. The benefits of summation are so great that other nocturnal insects, like Megalopta, very likely rely on it to see well in dim light as well. The world seen by nocturnal insects may not be as sharp or as well resolved in time as that experienced by their day-active relatives. But summation ensures that it is bright enough to detect and intercept potential mates, to pursue and capture prey, to navigate to and from a nest and to negotiate obstacles during flight. Without this ability it would be as blind as the rest of us. Why do wombats do cube-shaped poo? These stocky Australian marsupials are something of an enigma.